Tea towels date back to the early 18th century and have long served a variety of uses beyond drying dishes. Covering food, wiping up spills, insulating teapots and protecting teaware when it is being transferred from place to place… the tea towel is the original multitasking kitchen essential. When Vincent Van Gogh’s supply of canvases ran low, he resorted to painting on tea towels. While cotton and other less costly fibres are common in modern, mass-produced tea towels, our commemorative tea towel is made in Canada of 100% linen—appreciated as the superior tea towel cloth for its high absorbency and ability to dry delicate dishware without leaving scratches or lint behind. Although the embroidered tea towels of yesteryear are now something of a rarity, the decorative tea towel thrives today as a souvenir and gift all the while retaining its practical beauty. Guaranteed to soften with use over time, the CapU commemorative tea towel offers a bright and beautiful addition to any kitchen. 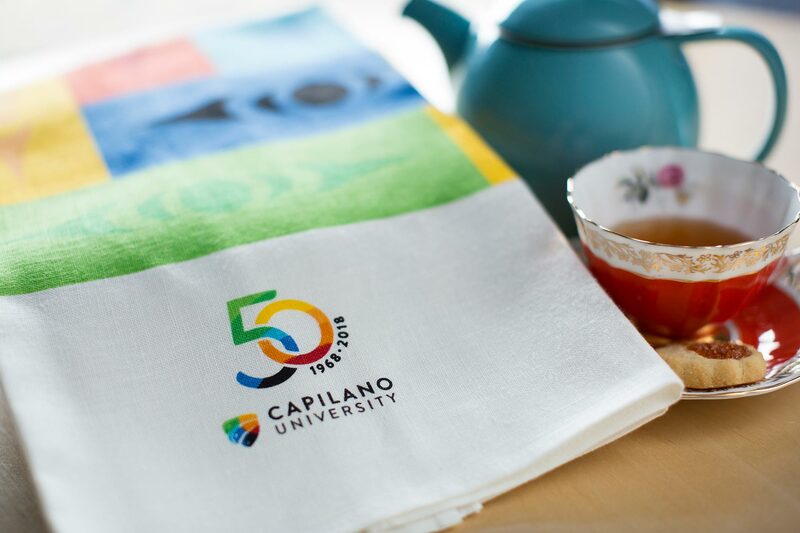 Find CapU 50th Anniversary merchandise including our commemorative tea towel in our online shop.